The tradition of ‘Pagal Veshakarar’ have really decreased I guess. So is the ‘Boom Boom Maatukkaran’!!! Ok, I know, to the non-Tamils these words sound like Greek and Latin. Ok, Pagal Veshakarar literally means ‘day costumed person’. But that’s rather a way too stupid translation. It actually refers to the people who dress up like Gods and come door to door and sing hymns of God. 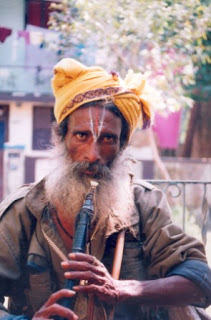 Most are from Andhra Pradesh and are nomadic tribes. They dress up as Gods with all ornaments inclusive of the skin color of the Gods painted on their body. This guy came over to my home on Vinayakar Chaturthi. This day was the celebration of Lord Ganesha’s Birthday and an auspicious day celebrated all over India. And this guy was dressed up all as Lord Vishnu with blue painted all over his body. He sang hymns on Lord and gladly accepted when I said I wanted a shot of him. Boom Boom Maadu is essentially a decorated bull; and Maatukkaran is essentially the guy with the bull. This is a tradition kept up by the Aadhiyan Community in Tamil Nadu. They are nomadic tribes from the Nagapattinam dt. of Tamil Nadu and are spread all over south India. They too are similar to the Pagal Veshakkarar, but the major difference is the bull – the highly decorated bull. They go door to door with the bull and with a Nadhaswaram, which is an Indian trumpet. The play music with the trumpet and sometimes sing too. They play the song we want them to play. Sometimes carnatic music, the classical music of South India or some old Tamizh movie songs too!!! Then they also say good things about the house & the people in it like and the bull will respond by shaking its head in positive or negative!!! Since this bull keeps shaking its head, it’s called a Boom Boom Maadu. He says, this house will be filled with happiness and laughter always right? Bull says, Yes!!! He says, the young woman in this house will be married soon right? Bull says, Yes!!! He says, no one in this house will have any health issues, no? Bull says, No!!! Then they accept whatever is given to them in cash or kind and proceed to the next house!!! Incredible? Yup. It’s Incredible India indeed!!! This guy came to our home once, but without the bull. His music was amazing and his Nathaswaram was soul stirring. I told him to play some nice classical masterpieces and listened for some 10 minutes. I was really intrigued by his outfit and I said I wanted a shot of him. He readily agreed. That was during my college days and my photography module was going on. My teacher saw that shot and was really impressed. About a year later he came back again and just did not recognize him. He had shaved his fabulous beard. Somehow no one else had asked him for a photoshoot, might be – On looking at me he promptly asked, ‘Remember me? You took a photo of me last time!!!’. I was like ‘Was that you??? Where is your beard?????’. Well, he had taken it off and I recognized him after taking a long look at him. He was really very happy to see the huge blow up of his pic which printed for my college presentation!!!!! Of late, with the so called development these awesome traditions are left lagging behind. Of late I don’t see many of them, very much to my disappointment!!! And the general population have the misconception of treating them like beggars, giving much stress to them to take the tradition forward!!! Shenai or Nadhaswaram???? Actually these people used to play Shenai. Btw, the young woman got married or not??? Its been ages since ive seen any of them! there used to be boom boom matukkarans here in bbay too, but now my son has never seen any! and i also remember those kazha kootadis... those who used to balance on ropes??? They all started studying/realizing. 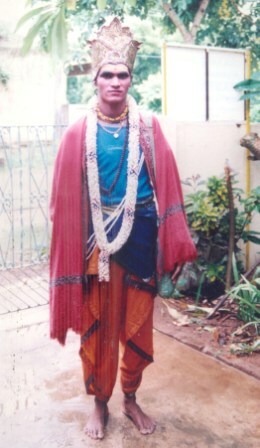 i knw a guy cald eashwaran, nw working fr google and was ta son of boom boom matukaran. btw, gud one. enjoyable. nice translation, lol. Like the tourism brochures I read, it surely is Incredible India! So colourful. I'm off to Bangalore and Kerala next week. Wonderful post. I see them. But they are very rare. It is very interesting to read these traditional folk going from house to house seeking alms.This is a very valuable tradition which should be preserved. However, since people are ill treating them, it is quite likely these people will look some other way of earning their livelihood. I remember many of these people used to appear during pongal time.I also remember one more person called MANIAKARAN.Normally he walks on the roads and streets during nights and one fine day he will appear in the day time to ask for money.Children used to be very frightened of this man.I wonder if this man comes even now. Thanks for your comments at Blogtrotter Two, which has now started to cruise the Nile for you, but without Poirot... ;) Enjoy and have a great week! We have read few of your posts and your blog is simply amazing. Thus we are leaving this comment. Blogjunta.com is hosting the first of its kind Best of Indian Blogopshere 2010 polls. Do particiapte in it. P.S: Sorry we were not able to locate your mail ID hence dropping a note here. Thank you for sharing such an interesting history. Like most traditions they fade through the passage of time and remain only in the tradition of oral story telling and even those die a slow death. Soon to be...??? Oye!! Enna nakkala!!! That's a nice way to be woken up in the mornings!! Thanks for considering my blog so worthy.